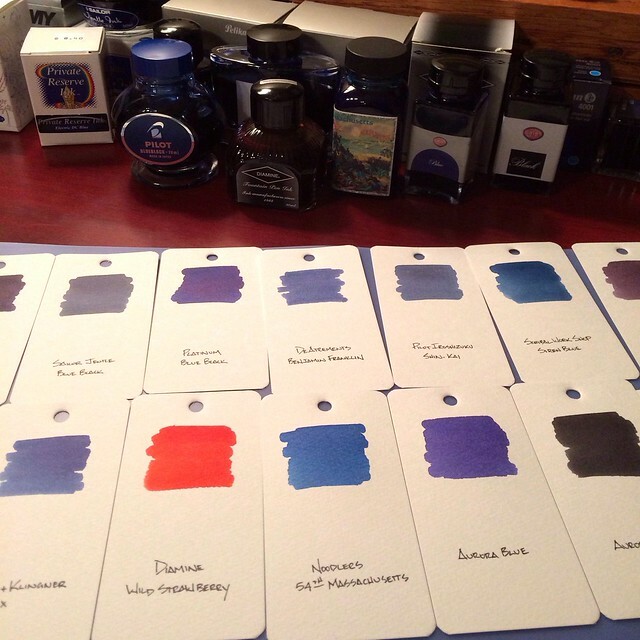 One thing I have always wanted is a visual sampling of my fountain pen inks. I have tried random sheets of paper and various notebooks but none have ever stuck. I wanted a good, thick paper and the ability to move the samples around and compare them side-by-side. Enter the Maruman Mnemosyne Word Book. The Word Book is basically Maruman's take on flash cards. 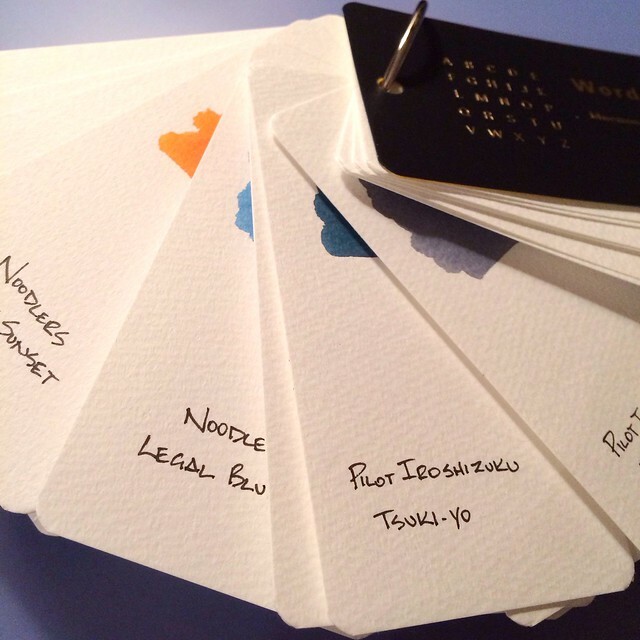 Used by students for memorization, these ringed study cards can serve many purposes. 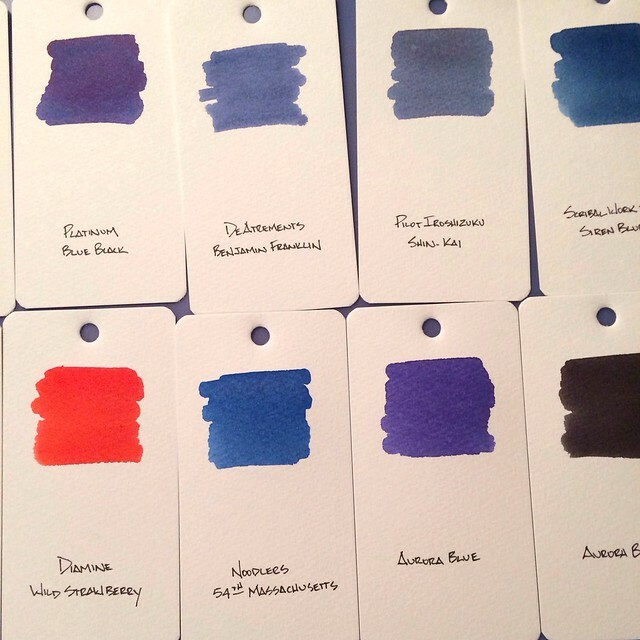 Personally, they remind me of a paint sample book and are the perfect setup for fountain pen ink samples. The cards are approximately 4"x2", giving me plenty of room for a large ink swab (using a basic Q-Tip dipped in the ink bottle) while leaving room for a written description at the bottom of the card. The cards are thick enough to where the large amount of ink doesn't buckle the card or bleed through. You could even use the back side for another ink sample, but I will probably use that side for ink notes. The paper is off-white and does have some tooth to it, similar to watercolor paper. For deadly accurate color representation I will admit it is not perfect. Since the paper is so porous it soaks up much of the ink and dulls out some of the colors. It works for what I am trying to accomplish but a smoother, perfectly white paper would be a better choice. Having the ring and pre-drilled holes is an awesome option. I can arrange the cards however I want, plus add and remove as needed. My only mistake was putting the ink sample near the top of the card. It would have worked much better if I put the ink at the bottom to where I could see them better when fanned out. Overall, I am happy with this setup. It allows for a quick comparison of inks and is easily accessible. I have swabbed all of my ink bottles so far, and will be moving onto my sample vials in phase two. The Word Book is a great deal for under $4.00 at JetPens. Posted on January 2, 2014 by Brad Dowdy and filed under Ink Reviews, Maruman.